How Many Hats Is Too Many? I finished yet another hat! This is a gray alpaca version of the first tam I made. It’s knit from KnitPicks Andean Treasure. Baby alpaca, sport weight, great stuff! Technically this is the second time I’ve finished it, as I had to knit the ribbing twice. 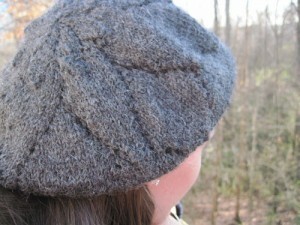 The yarn just wasn’t elastic in 2 x 2 ribbing form! That, and it draped so much it would have fit Barney the Dinosaur. Enlarging the rest of the pattern has definite drawbacks. I solved the problem (with help from the knitting sister!) by raveling back — which was painful, but not too scary — and then going to size 1 needles, as well as decreasing a little more. It worked very well, and I had hoped to deliver it to the recipient at church today, but she wasn’t there. 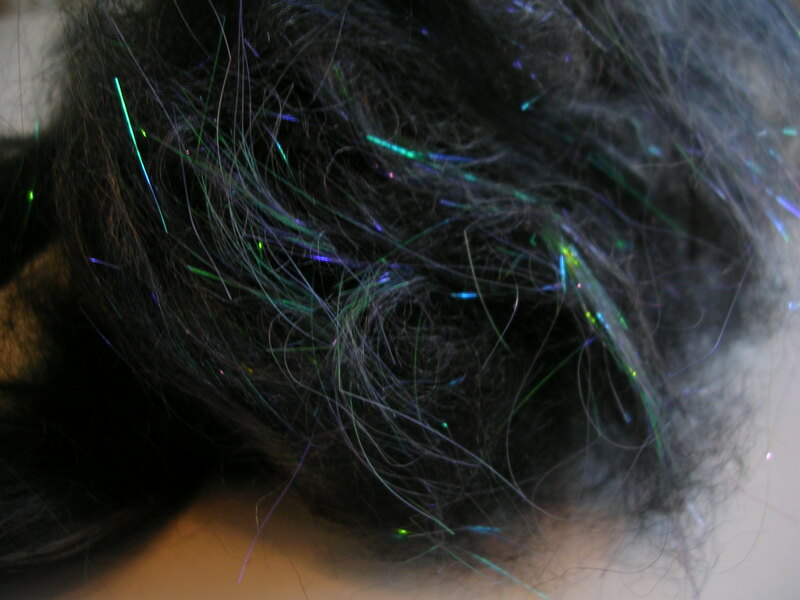 And, lest you think the lack of recent posts means I haven’t been doing anything fiber-related, let me inform you that I have enough material for two posts now. Part B will go up tomorrow. The spinning front had been deceptively quiet for the last week or so, and I was getting to feel like it was just lurking around the corner waiting for me to come by so it could jump out and trip me into paying it attention. In fact, I knew something was up with the fiber fairies, because my closet threw a pack of dpns at me and hit my knee with a dye pot when I wasn’t looking. (Well, I was looking, but for something else.) However, I placed a megaload of audiobooks on hold at the local library and now they are in, and spinning no longer feels neglected. Thanks to The Book of Three audio, I wound off an entire finished bobbin of indigo merino, and now I’m halfway into a new one. I also wound off the silk laceweight I had on my cream-colored wheel. That was to free it up for a really neat special-order yarn inspired by ravens’ wings. Here’s a little taste of what the fibers look like. And I’ve gotten started on the cowl neck sweater. Several times now, in fact. The first surprise came when I learned that, just because the pattern calls for worsted weight, you should still look at the numbers for the gauge swatch before ordering. Come to find out it would take a pretty beefy worsted weight to make three and a quarter stitches an inch on size ten needles. I ordered worsted from KnitPicks, which tends to run a little thin anyway, so I am now getting five stitches an inch on size eights. Care to do the math, anyone? 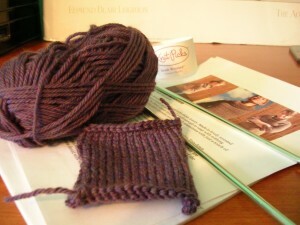 Thankfully my knitting sister came to the rescue and knocked the first bits of the pattern into shape. Then I got my usual miscalculations on how long the yarn needed to be for the cast on, and then I got it twisted, but fixed, and then I started putting in too many increases. So, two tries down the tubes. Then my sister taught me the cable cast on, which is my new friend. I don’t have to guess how much yarn to use and it’s just like crochet! Turns out I had been casting on the wrong amount of stitches anyway, so it was all for the best. I’ve learned two new knitting things now. The cable cast on, and KFB. I had to ask about the KFB. And I was greeted with “Of course you know how to do the KFB. Everyone knows how to do the KFB. It’s knit front and back.” Well, excuse me! Although everyone does now, because I have been enlightened. And once I figured out to keep the working yarn well away from the needle while going for the back knit, it worked pretty well. I shall leave you with a photo of my official gauge swatch. I knit it carefully, bound it off, and washed it, thus bowing to the rigorous standards of the higher order of knitters. However, I kept my own flavor in there and knit a three and a half inch swatch instead of four, just because I didn’t know any better. Picture of the finished Blue Baroness Beret tomorrow, as well as sundry other fun things.